Listen to "Adnan's Story: The Search for Truth and Justice After Serial" on your iOS and Android device. But Serial did not tell the whole story. In this compelling narrative, Rabia Chaudry presents new key evidence that she maintains dismantles the State's case: a potential new suspect, forensics indicating Hae was killed and kept somewhere for almost half a day, and documentation withheld by the State that destroys the cell phone evidence -- among many other points -- and she shows how fans of Serial joined a crowd-sourced investigation into a case riddled with errors and strange twists. Adnan's Story also shares Adnan's life in prison, and weaves in his personal reflections, including never-before-seen letters. Chaudry, who is committed to exonerating Adnan, makes it clear that justice is yet to be achieved in this much examined case. This audiobook is perfect for listeners interested in true crime and social justice. The summer of 2016 has proven to be a pretty good few months for Adrian Syed. With the murder conviction of Hae Min Lee being vacated and the release of a best—selling book he contributed to chronicling the days leading up to his arrest and the subsequent years, it seems as if Adnan’s luck is finally turning around. 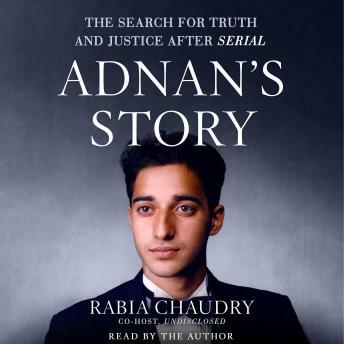 Adnan’s Story, written by Rabia Chaudry with contributions from Adnan himself via various letters, was a much-anticipated body of work. Since following the Serial podcast, as well as both the Undisclosed: The State vs. Adnan Syed, and Truth and Justice (formally Serial Dynasty) podcasts, I couldn’t help but want more after the seasons focused on Adnan’s case ended. (Which by the way, I thought the titles of these three key podcasts were cleverly woven into the book cover.) But many of us are waiting with bated breath to know what happens next in this fascinating story of whodunit. Unfortunately for Hae Min Lee, this was not just a story, it was real life, her life that was tragically ended at the hands of another. I originally purchased the hardcover version of this book, but after only a few chapters in, I resigned to purchase the audiobook version. The main reason being the difficulty in following the story through the text. The audio version of the book was much more easier to follow, than the text version. I really respect Rabia, but if I’m being honest, the book was written as if sentences were thrown together, and not a coherent account of the details. It failed to ?ow artistically or even in a well thought manner. Books go through numerous rounds of edits between the author and the editor/publisher. But this really seemed to be lacking, and read like the first or second draft of the book had actually been published. For someone as smart and talented as Rabia with a law degree, you would expect a much higher quality of writing. It puzzles me the number of reviews praising the writing of this book. I found myself reading along with the audio version a few times, and identified several points throughout the text version that have errors. However, these errors were corrected in the audio version, and hopefully will be corrected in future iterations of the written text. Additionally, the ?ow of the book was not the easiest to follow as it jumped back and forth instead of chronologically. I can’t see a legitimate reason for writing this particular story in a non-linear way. Parts of the book were super redundant, and not for any obvious reason. Ideally, the book would have begun with the reports of Hae’s disappearance and Adnan’s ultimate arrest. Then an explanation as to who Rabia is and her relation to Adnan and his family followed by the chronological details of the case unfolding, sprinkled with tidbits about Rabia, ultimately leading up to the inception of Serial, the appeals and the present day. The last few chapters were pretty decent, and this may be because it takes place in the last 2-3 years so it is fairly recent events, OR because it’s first-hand information of Rabia and her interactions with Sarah Koneig, Susan Simpson, Collin Miller, and Bob Ruff. The last few chapters are essentially about Rabia’s life. I will admit that I enjoyed reading about the strained dynamic between Rabia and Sarah and for me it explained why I felt Rabia was a bit cold whenever she mentioned Sarah in interviews. What can be assessed from the writing, and from Rabia herself, is that she is not nearly as familiar with the case and the minute details as you might think for someone writing a book about it. I totally respect that she wanted to capitalize on the popularity surrounding Serial and the case itself. But a?er hearing/reading the letters that Adnan has written over the years, we all know how well spoken and how good his letters and his writings are. So while up against a self-inflicted deadline, given the opportunity, I think Adnan would have written an amazingly beautifully crafted harmonious manuscript. I’m really curious about Adnan’s thoughts on the book itself or if he’s been able to read it in part or its entirety. But my gut tells me his focus is on his appeal right now and that Rabia was the one doing the heavy lifting save for the few letters Adnan wrote for inclusion in the book. As for the book's contents, there was not much new information included in the book that those who haven’t been following the podcasts and online readings, would not be aware of already. So I’m a bit biased in that aspect. What I did enjoy were the personal details of Adnan’s life in prison, and how his family was coping with his imprisonment. I also believe that including the guidance that Christina Gutierrez gave him about refraining from contacting anyone outside of his immediate family prior to the trial helped put things in perceptive for outsiders. It is pretty clear to me that this book was written for an audience that is only familiar with Serial. This book was written to tie together, Undisclosed, Truth and Justice and both Collin Miller and Susan Simpson’s blog posts and legal commentary. For those of us well versed in the three podcasts and practicing attorneys, there was not much new. If your a huge fan of Serial and Undisclosed- this is for you! It helped me understand and organize all the info given in BOTH podcasts! Definitely recommend! Loved this book. I\'ve listened to both Serial and Undisclosed - I was worried this would be repetitive but pleased with the amount of new information/perspective. Hooked on serial and undisclosed, I just seem to want to know more about this whole story. My heart goes out to Adnan and his family and Hae and her family. I pray that Adnan is found innocent and that the real killer is found. This boy, now a young man, deserves to have his freedom. I loved this book! I could honestly write so much about how the book was beautifully written and Rabia's voice made this experience even better but I'm short on time. I listened to this book while at book and it really kept me thoroughly connected. I liked this audio book a lot! Great narration and story! Excellent book. Excellent narration. Excellent people. Very touching, Adnan voice was definitely present . Loved it !